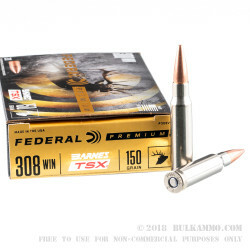 This 308 Win cartridge by Federal Premium sports a 150 grain Barnes Triple-Shock X-Bullet (TSX). The all copper construction of the TSX means that it can’t experience core-jacket separation on impact, giving it virtually perfect weight retention for deep penetration. 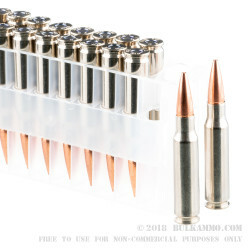 It also makes it acceptable for use where lead bullets are banned, including California. The TSX additionally features multiple rings cut into its shank which serve to minimize fouling, reduce pressure, and provide substantially increased velocity. The TSX also expands on impact to create four extremely sharp cutting edges -- these provide just the stopping power you need to drop rugged bucks and tenacious hogs with startling reliability. 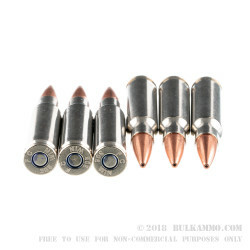 This round offers a non-corrosive Boxer primed factory fresh brass casing, the ideal stuff for work at a reloading bench. When you combine Federal’s renowned dedication to technologically advanced ammunition production along with Barnes’ most popular hunting bullet, you can certainly expect unparalleled performance out in the field.